Everyone loves eerie abandoned things; derelict parks, stadiums, factories, train stations, and rest stops are equal parts beautiful and spooky as hell. There's something extra unsettling about a sad, lichen-covered car that really stirs the imagination, though. Usually when someone ditches an automobile in a long-forgotten corner and doesn't come back for it, some pretty sketchy circumstances are involved. Like crime. Or zombies. Abandoned cars also make for great photography, so there's that. 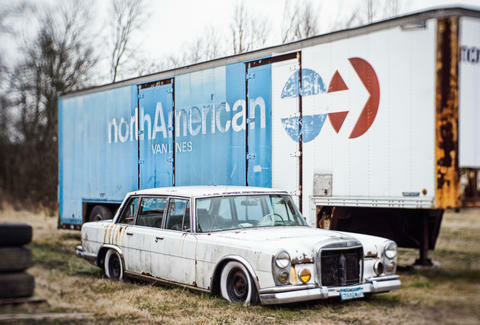 Instagram's got a fascinating lineup of found cars; here are some of the very best. Not gonna lie -- the creepiest thing about this photo is how well an old Mercedes ages when left in a field for decades on end. I mean, just look at this thing. You can basically hear its undead groan through your screen. It really should be put out of its misery. This is actually a junkyard, but something about it -- maybe the crooked hood -- makes it look like someone punched this car in the face. It just looks like it's seen many, many things, doesn't it? "Oh my God. They found it. I don't know how, but they found it." If life were like the movie Cars this would be someone's intoxicated uncle. You know that scene in Jurassic Park where the velociraptor eats Muldoon? Seriously, what went down that compelled some ridiculously wealthy person to leave an otherwise decent-condition Rolls-Royce in the middle of nowhere? Aaron Miller is the Cars editor for Thrillist, and can be found on Twitter and Facebook. He sees faces in many of these cars. It makes him sad to see them suffering so.